Does anybody have that concert that can upload the video. I know it was once posted here long time ago. This was concert was final concert of Racer X without Paul Gilbert while Bruce is playing entirely. All I can find from the "Just Bruce" show is Motor Man and Scarified. A gall bladder problem has been confirmed. Obviously, this makes surgery even more likely. I'm thinking that all of the past and/or present Racer X member articles need dates of birth, places of birth, and discographies. The problem is, I'm not sure of the best way to integrate these into what's already in the articles. What's already done of this may need rearranging. Sorry to hear that man, best of luck and keep us updated. Pulling for you out here in the Bay Area. I'll do my best to keep working on the wiki. Getting busier out here but it's still a priority. Thankfully all the major stuff seems to be done. As always, anyone let me know if there's anything that should be on there. I think the wiki needs more detailed information on Paul's pre-Black Sheep bands. Unfortunately, my knowledge in this area is very limited. I'll see if I can dig anything up. All I have from that era is the Scotland tape, and I know a few things... like the "Paradiz" where his drummer ran out of room when he was writing the band name on the bass drum. I also know he was using the Mr. Guitar in those days, but that's it. If anyone has some more info on his early bands, let me know. There was a bit about that era in some of the monster podcast interviews I mentioned above. I'm slowly working on navboxes for the Racer X wiki, because I still haven't figured out a lot of the mechanics of the Fandom/Wikia wikis. I'll go back over the podcasts. 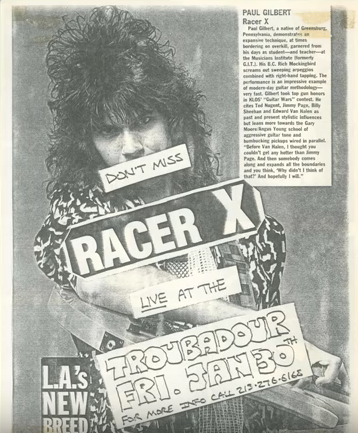 Anyone have any old Racer X flyers/ads? I have the following: the flyer from the Extreme Volume shows at the Country Club, Second Head album release party at the Country Club, D'Angelico Strings ad with Bruce Paul & John. I remember there was one that said like "Don't Miss... RACER X!" It was a pink flyer, and I can't find it anymore. I added infoboxes to the album articles and filled in most of the information. The infoboxes for Technical Difficulties, Superheroes, Live At The Whisky: Snowball Of Doom, Getting Heavier, and Official Bootleg: Snowball Of Doom 2 need album covers. I've got "makeshift" infoboxes for the members set up. The "makeshift" infoboxes for Todd DeVito and Chris Arvin need photos. A photo of Harry Gchoesser by himself needs to be looked for. I haven't figured out the proper way to set up navboxes. I haven't figured out A LOT about the Fandom wikis. I can do personally to make the Wiki better. This is the ad I was thinking of. It's in the intro to Paul's "Scarified" series on YouTube. Anyone have it in better res? I'm actually making some progress with figuring out how the Fandom wikis work. I still don't think I've figured out a lot about infoboxes. The Guitar World article in the background? Possibly. I've been wondering if an article on the Racer X "practice session" needs to be added to the wiki. Unfortunately I don't have much info on the practice sessions. Just that they were in the P-1 rehearsal room at MI and that they'd usually draw a crowd after about an hour of playing. I added a lot of photos from those sessions to the pages, though. I'm starting one Fandom Wiki after another. This is because Wikipedia, well, you know. I'm finally making progress again on the Racer X wiki. It might be an idea to include PG's relatively recent move to Portland, Oregon in the Wiki (source: NGIS podcast).